I have written quite a lot over the last few years about Brian Menold and his wonderful work at Wood Wonders. You all know that after he lost his job he turned to puzzle making full time and I make it my business to try and keep his business going. I like to buy a few of his new releases each time that he makes an announcement and about 6 weeks ago was no exception. 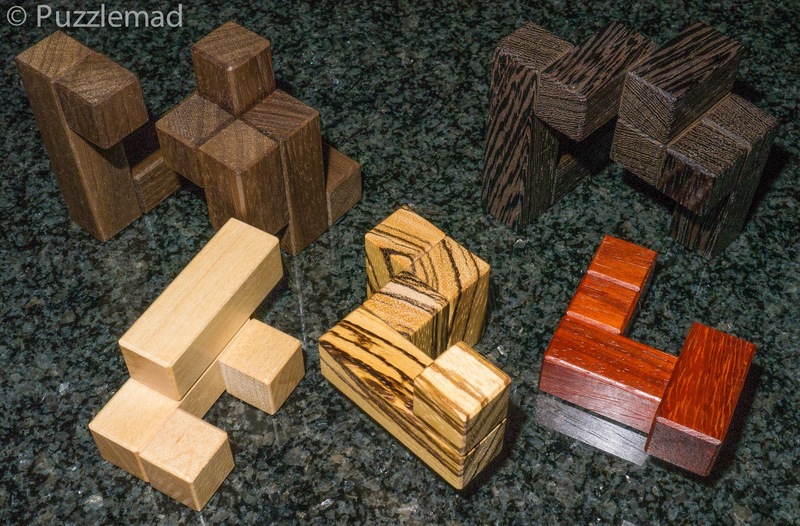 I chose a few puzzles that were either full of multiple rotations (a subgroup of puzzles that I really got into after my friend Bernhard Schweitzer introduced me to them) and one that a really good friend told me as soon as he saw the preview pictures that I just had to get! 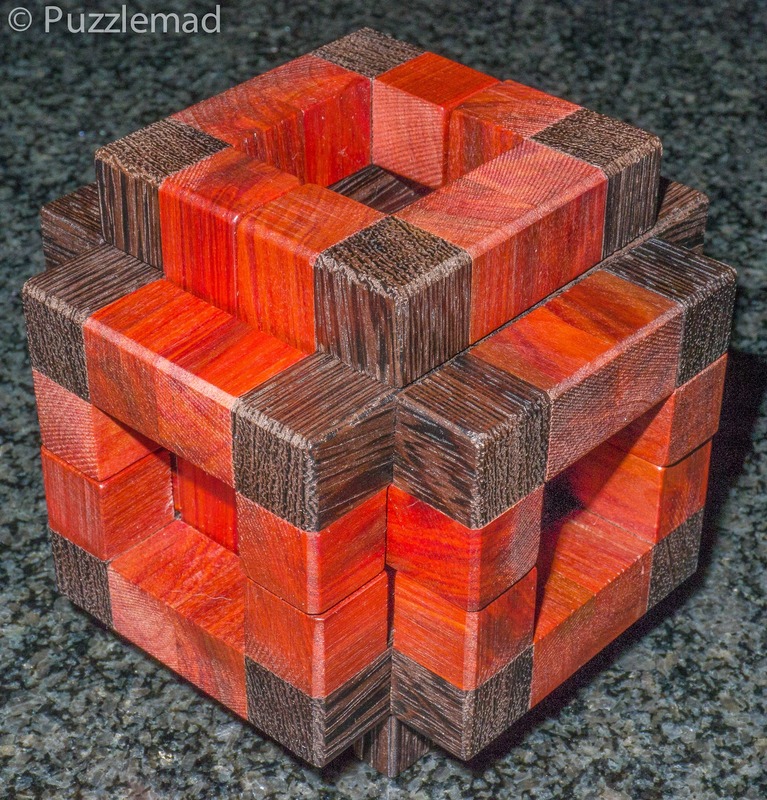 The puzzles in the picture above are Dizzy cube, 4C Vortex and Brackets burr. Brian finished making them and after I paid he let me know what the price of postage would be and after a small PayPal transaction they were dropped off in a small US post office (apparently to small to know what they were doing with international postage!). After a few weeks they had not arrived and I had not really thought much about it when Brian sent me an email to ask about their arrival. He asked me to wait a while longer and if they didn't make it here he would make good. Another 2 or 3 weeks later I received an email from the USPS that a certain Wood Wonders had sent me another package. I contacted him to offer some more money as I didn't want him to lose out and he wouldn't hear anything of it. It would appear that he had made a couple more and sent them off to me at his own expense. They arrived just a week later and that is a testament to his phenomenal customer service - you just know that whatever you buy WILL arrive and WILL be beautiful! 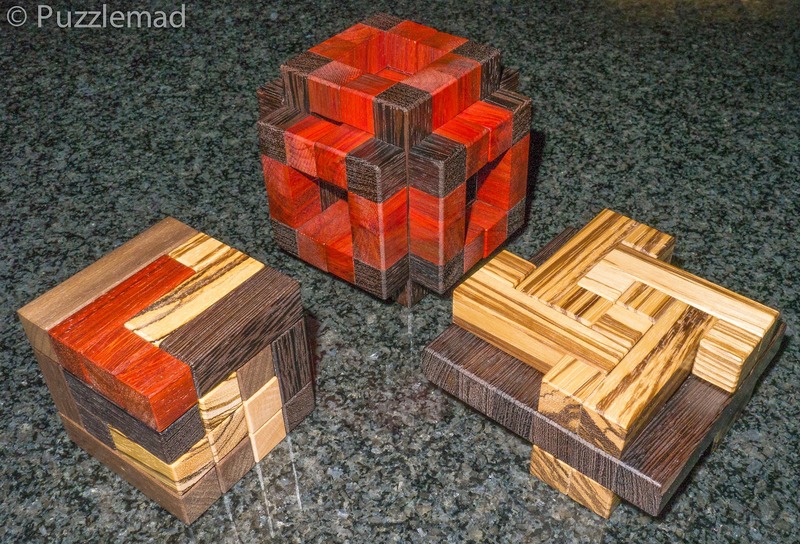 I started as soon as they arrived with the Dizzy cube Designed by Chi-Ren Chen and made from Wenge, Bocote, Walnut, Maple, Red Oak and Padauk with a different wood for each piece. It is 2.5" x 2.5" x 2.5" in size. The low level solution of 1.4.3.14 would make it appear very easy but let me say that it has a decent challenge to it. 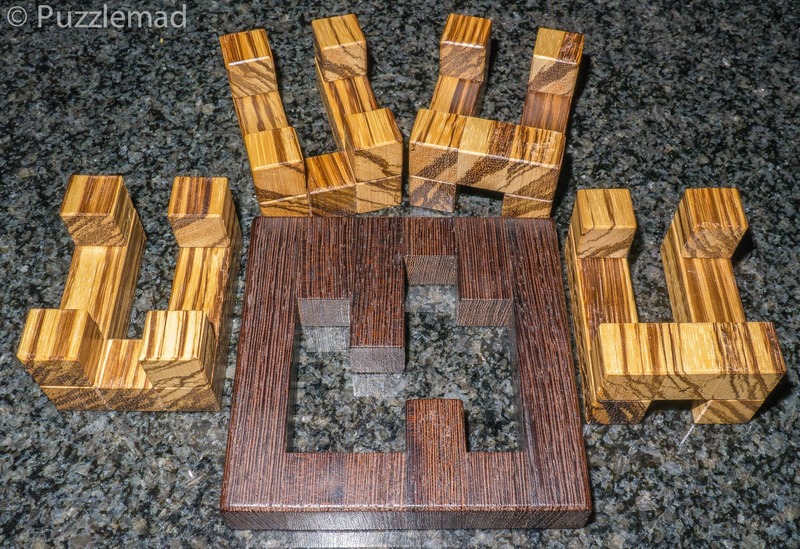 The difficulty is provided by the separation of that last 2 pieces which is only possible with quite a lot of rotations (hence the rather appropriate name for this puzzle). The first move is really easy - just pull a piece out but the next 2 are only orthogonal moves and really quite a lovely dance. 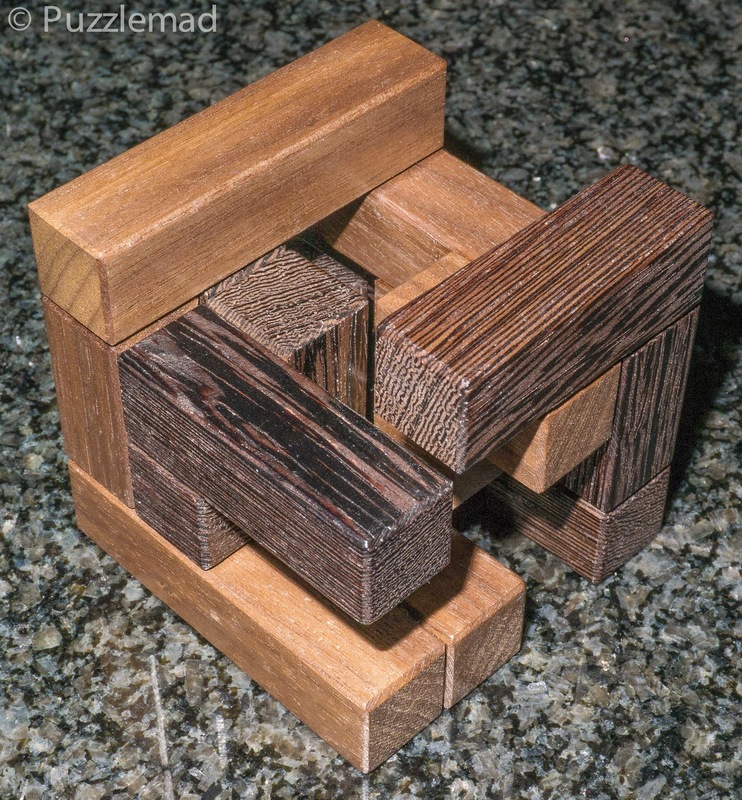 This leaves you with just 2 cage-like pieces interlocked and a few orthogonal moves and rotations to take them apart. This reminds me of one of my favourite Turning Interlocking Cubes of all time, the Changing Partners from Bernhard and also designed by Chi-Ren Chen. 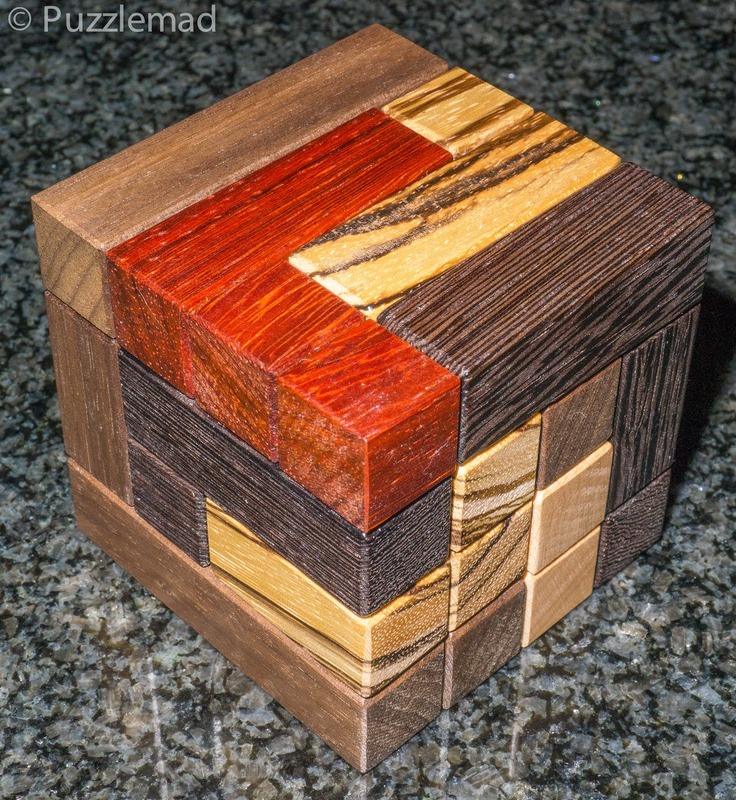 That puzzle consists entirely of pairs of frames that need to be interlocked into a cube shape and it is a tremendous challenge. If you ever get the chance to obtain it then don't hesitate for even a moment - buy it! Maybe Bernhard will get some more? So I needed to find a long sequence of moves that allows the 2 final pieces to separate and Oh boy! it took me a whole day to find those moves! One or 2 of them were just so well hidden that I couldn't find them for ages and even now, despite knowing the general direction of the moves, I still struggle to separate those last 2 pieces. This makes the Dizzy cube one of my favourite TICs. If you find a copy available then you will love it. The first three rules of a good rotational puzzle is Rotation Rotation Rotation! I cannot resist these woods! Putting it back together was fairly easy because I remembered what I had done and the general patterns I had achieved in the process. I dare say that if it had been shipped in pieces then starting from that would have been really very tough indeed. 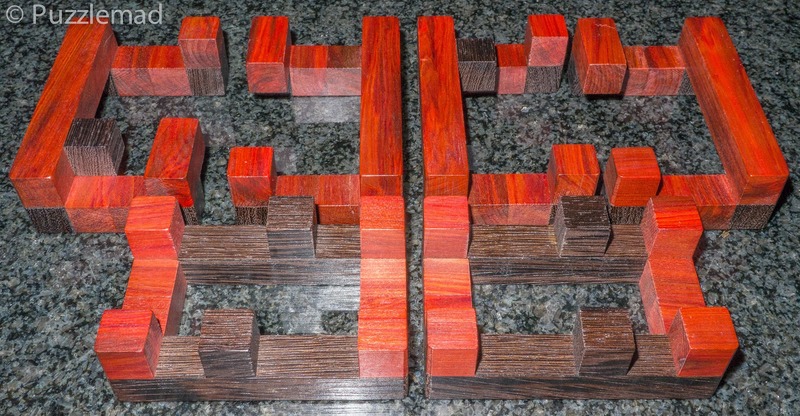 I was sure that my own solution had not taken quite so many moves (11.4.7.4) and after a while I continued to experiment and discovered a second method of separating the pieces which required considerably more moves (closer to the quoted level) - I appear to have found an alternative solution to that intended by the designer. I think this one may well end up on show in my living room - I haven't asked Mrs S yet but I think it is certainly beautiful enough to go on display with the more beautiful of my collection. Do you agree? Brackets Burr - how beautiful is that? Now this fabulous beauty is Brackets burr which I saved until last. It was designed by Stéphane Chomine and was made in response to a suggestion from a puzzler. Brian was warned that it was very difficult to manufacture and it certainly appeared to live up to that. In fact it was so tough to make that Brian wrote that he will probably never make them again! For this reason, I am all the more grateful that he would produce an extra one for me after it was lost in the US post! He made four variations and I chose the one with Wenge and Redheart. It measures about 3.75" x 3.75" x 3.75" and has a difficulty level of 14.12.3 but this time with no rotations. 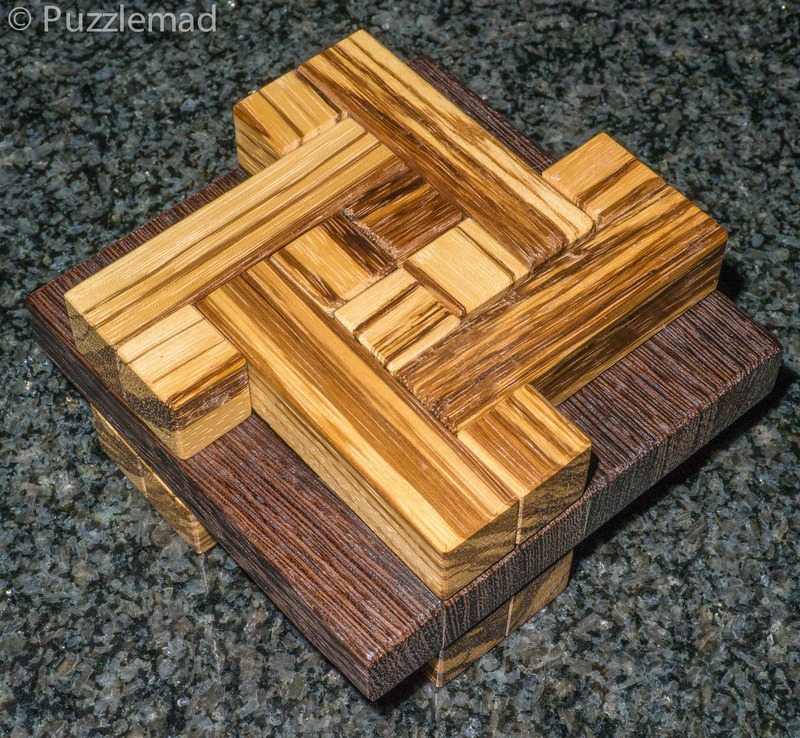 This puzzle seems to have quite a lot of movement of the various pieces and once a few initial moves are made it opens up for a huge amount more. I managed to get lost several times and it took me quite a while to even get back to the start again. Gradually there are more possibilities discovered and I reached a point where it seemed that a piece might come out but it was just trapped by another single piece. No matter what I tried, I just couldn't work out a way past. I played with it every evening for 3 weeks and only managed to try the same thing over and over again! Yes madness I know but that's me! Eventually by accident something new happened and a slide was possible that unlocked my first piece! Now there was a HUGE amount of movement but again the pieces were still very heavily interlocked and it took me a good few days to release the next piece after which it was fairly trivial. Thank goodness it wasn't sent out in pieces! If this had been sent as pieces alone I would have been forced to use Burrtools. After scrambling the pieces I was still able to assemble the puzzle because of the huge muscle memory that I had developed during such a prolonged solve. I did make an error with the initial piece position but discovered this quite early when I couldn't reinsert the 4th piece fully. I agree with Brian's advisor that this one is an absolutely tremendous puzzle and despite only have 6 pieces really caused me some difficulty! If you see any of these beauties up for sale then don't hesitate - they are brilliant challenges and remember that Brian's workmanship is fabulous and his customer service second to none! The puzzle geniuses do it again!